I love us to drive through Robbins Range to enjoy the quiet with the beautiful rolling hills. We’ve driven it a few times over the years and have taken my visiting sister and husband to see the Range; I could never tire of it. The history remains a mystery to me even though our dad’s family spent a few years in this part of the country during his young years. 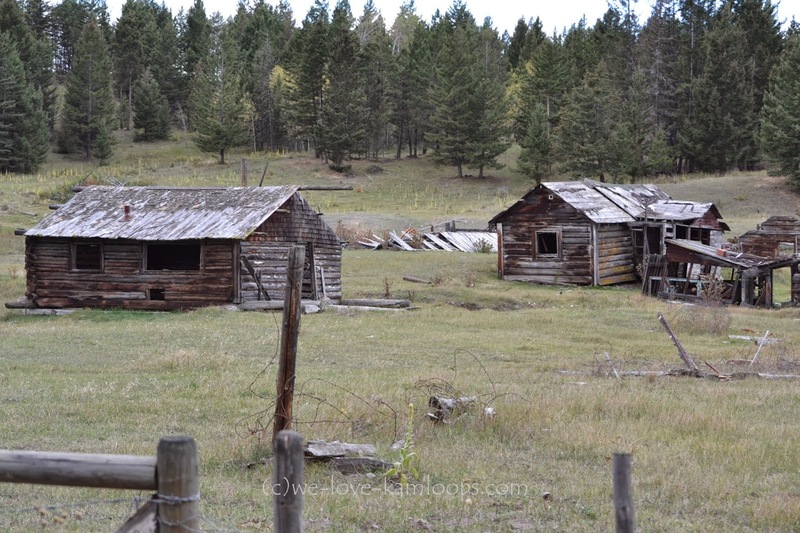 In days of old, there were family homesteads scattered throughout Robbins Range area. There is still evidence of those days when we drive up there now, but little sign of life today other than some cattle grazing in the fields. 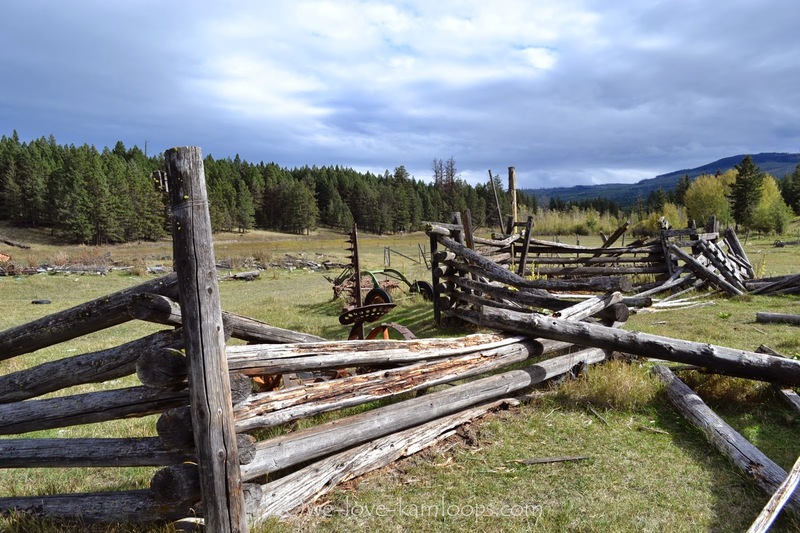 The ruins of some of these log cabins which were once homes to the families who had lived in this area still offer some insight into what life may have been like back then. The bare bones of a log cabin are nothing more than logs stacked together to create four walls then a roof. Insulation as we know it was not used. 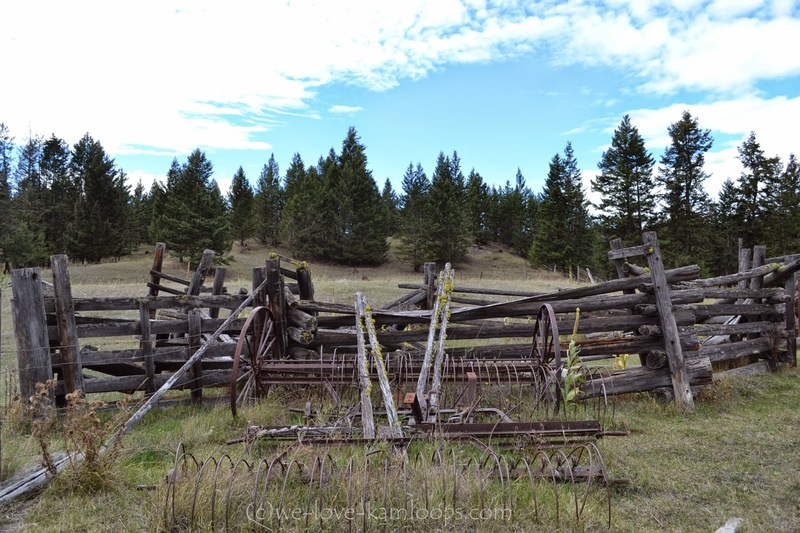 Old farming equipment can still be found sitting amidst the ruins of fences which may have been corrals for the horses and cattle. 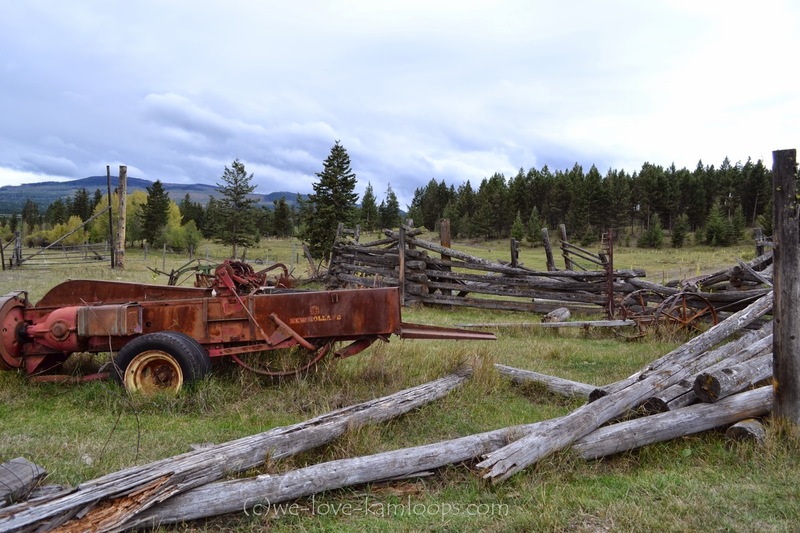 This drag harrow was likely pulled by a horse as the attached wooden poles would have been used us a hitching device to harness the horse to it. This old farm equipment may be from very early days as this company that originated in 1895 changed names in 1947 so it could be from those years in between and likely the 30’s. I am guessing but perhaps this is a baler. 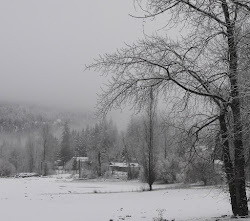 These hills were also once part of the logging industry, although there are no signs of that now. 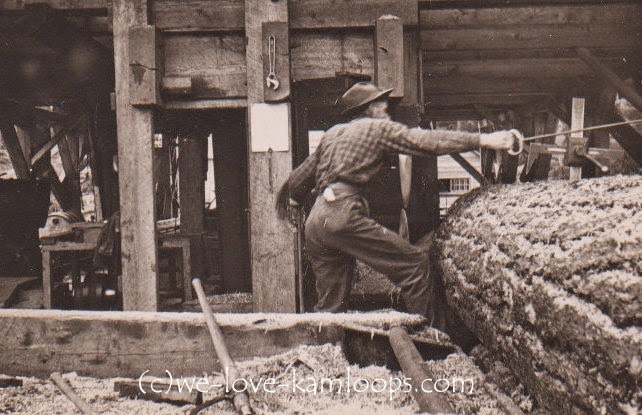 A sawmill was brought in by Ed Hughes, my grandfather, in the 1920’s-30’s who went into business and employed local men. This worker is Reg Gardiner, a local man who later married my grandmother. 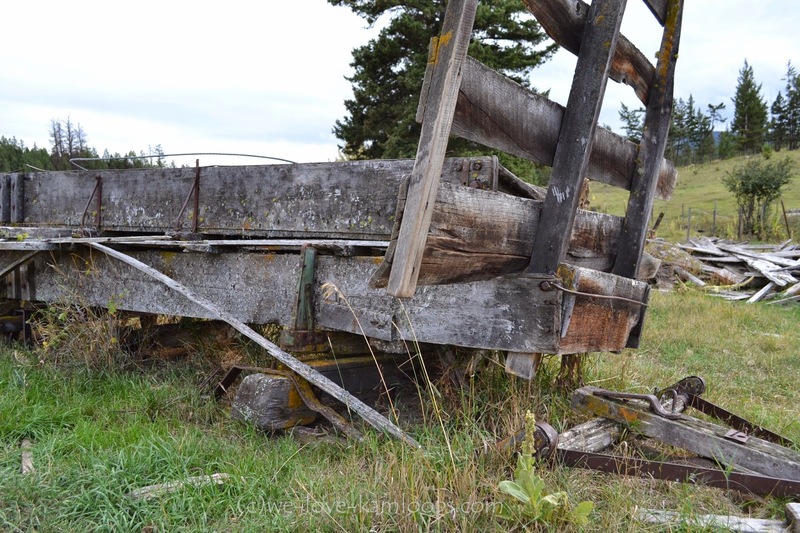 If anyone has information concerning this sawmill, I would appreciate hearing it. We can see how far transportation has come when we see carts like this. I don’t think this would be the main transportation for family outings but it sure would have done plenty of hauling hay or other chores on the farm. A close look shows there are skis rather than wheels so it may have been used to slide across the field whether there was snow or not. 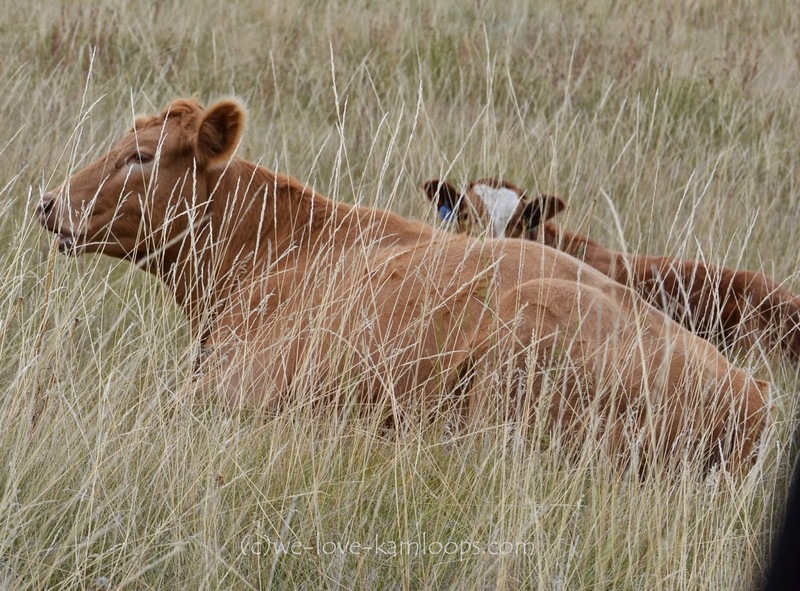 There are many ranges for the cattle up in this area today but there are very few signs of life other than the cattle. 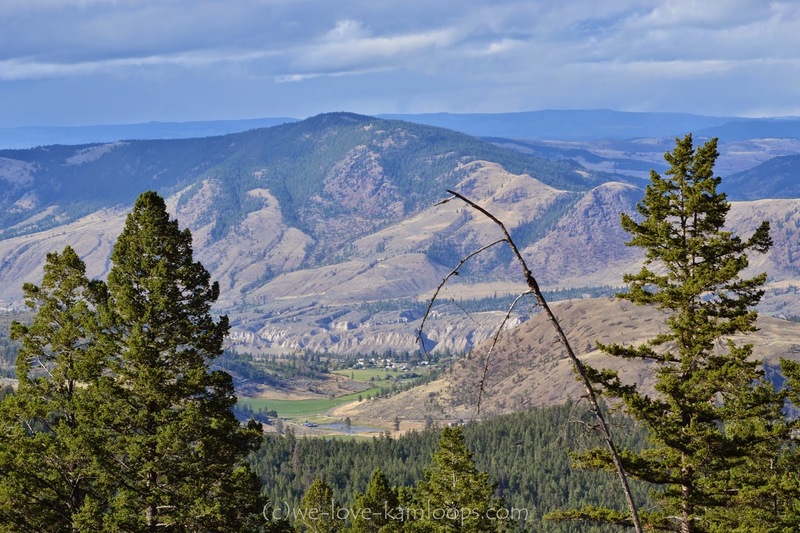 You’ll see more homes as you drive through the other ranges and Barnhartvale, which are all part of the beautiful countryside just outside Kamloops. Elevation is higher up in the trees and offers quite a view as we head back home after a great day of enjoying all the views. Robbins Range is still that special place for me and even though the best I can do is imagine what life was like here in the 30’s, it is a lovely afternoon drive. There is more on Robbins Range, if you wish to see that, click here. 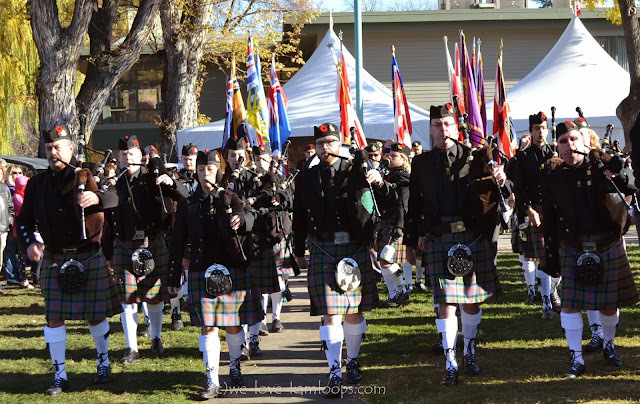 Just another reason why we love Kamloops, there is no place like home. 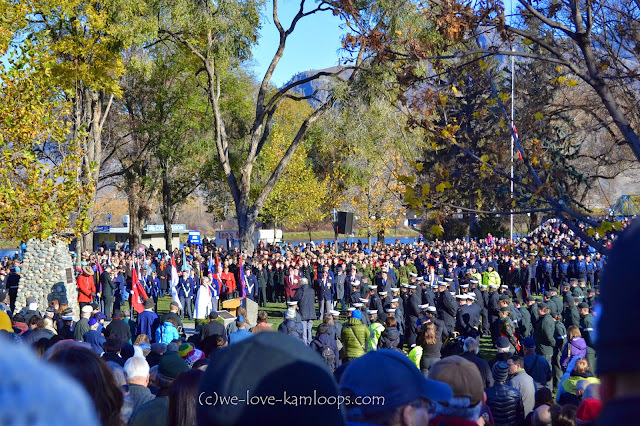 November 11th is called Remembrance Day in Canada and has been recognized since WW1. 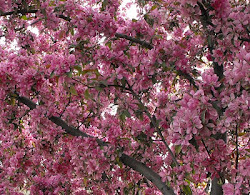 It was first observed in 1919 throughout the British Commonwealth. Originally called Armistice Day, as it was to commemorate the armistice agreement that ended WW1, it was celebrated on the eleventh hour, on the eleventh day of the eleventh month. It is observed around the world on this day but most countries still call it Armistice Day. The Americans celebrate Veteran’s Day on November 11th. We stopped by the Kamloops Cenotaph and poppies decorated the monument and some wreaths were left. 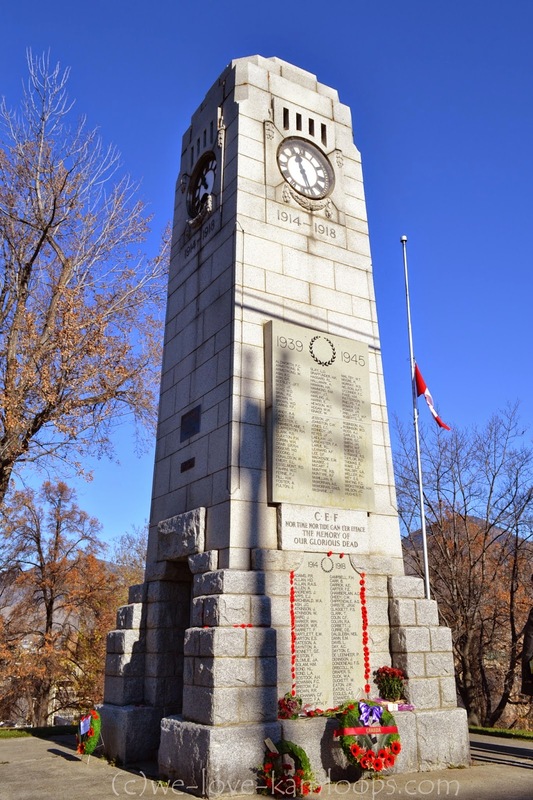 Cenotaph is a Greek word for “empty tomb” and laying of wreaths is a traditional means of signalling high honours in Greece, so the Remembrance Day follows with that tradition. 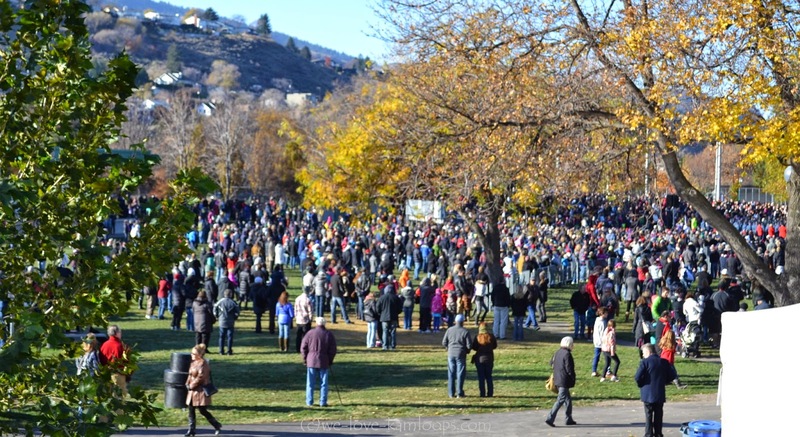 As in most cities across the country, people gathered, at Riverside Park in Kamloops, BC, to honour the veterans who fought in the wars of yesterday as well as those who still do today. 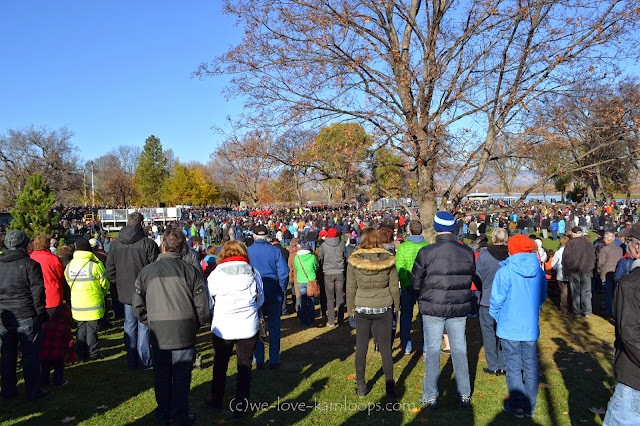 2014 proved to be a special occasion by the numbers of people who came to watch the ceremony today. The parade made its’ way into the center of the crowd by way of a temporary corridor set up and everyone in the crowd applauded as they passed by. 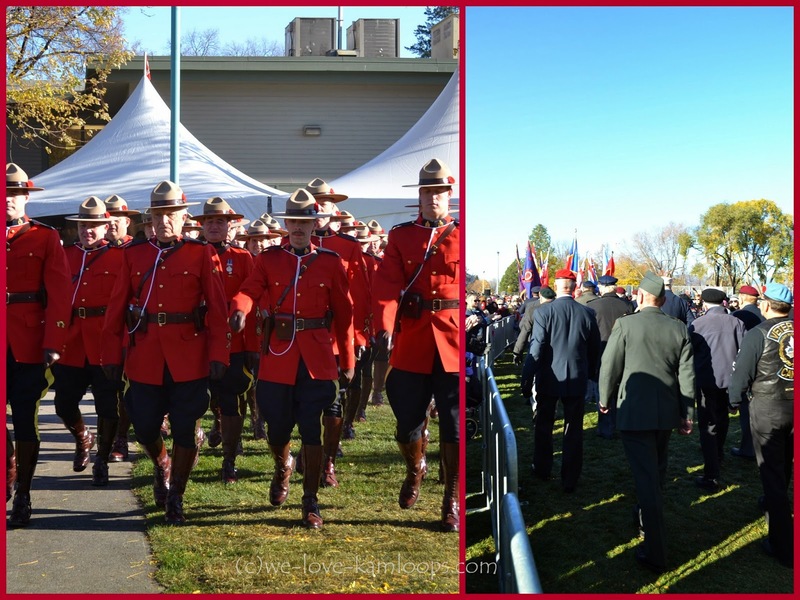 The RCMP in their red serge march by to much applause and they are followed by more uniforms, the Rube Band, the Pipe Band, and last but not least were several veterans to end the march. 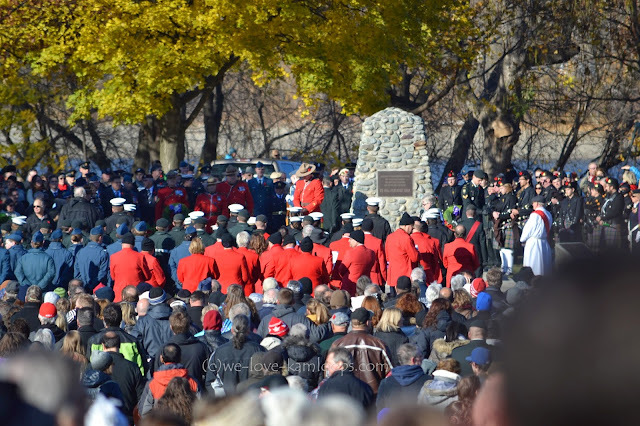 Uniforms joining those who had passed by our spot could be seen in the crowded field to honour fallen soldiers including the Rocky Mountain Rangers and Cadets. Our national anthem was sung then the Last Post was played on the bugle, a familiar yet rather sombre sound. This was followed with a two minute silence. The Fly Past was done by two from the 419 Squadron out of Cold Lake, Alberta then followed by “Reveille”, also played on the bugle. Prayers and blessings were given then followed by placement of wreaths by various representatives of the government plus many others. Everyone is welcome to add their own wreath at this time. In Flanders Fields is a poem written by Canadian Lieutenant Colonel John McCrae with a powerful message. 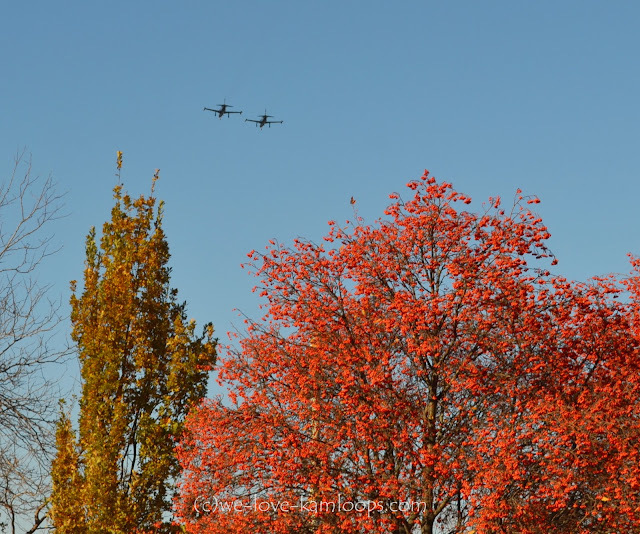 There is more Remembrance Day from past years, click here to see one and here if you'd like to learn more about the 419 Squadron.